Adopted by the Board of Trustees Oct. 21, 2014. To provide safe, reliable, clean and courteous public transportation. The transportation mode of choice for those with transportation options, and the lifeline for those dependent upon our services. Recognized as a transportation industry leader and viewed as the most well-run public agency in the United States. RTA will be a top-flight organization with a first-class image. An employer of choice in Northeastern Ohio, attracting, developing, motivating and retaining an outstanding and diverse workforce. A champion for sustainable transportation, not only in reducing miles driven by private automobiles, but also by reducing waste and emissions and conserving resources. A sustainable financial position by securing local, state and federal funding to maintain a realistic operating and capital plan. Expenses will be controlled and a minimum 30-day operating reserve will be maintained. An increasing impact as a regional transportation authority by increasing our regional influence, improving efficiency and the coordination of services. Upgrade and manage technology and technology systems to best serve our customers, and achieve or exceed the efficiencies these systems were designed to supply. Achieve an infrastructure state of good repair, including the systematic replacement of our buses and trains. We will ensure execution of an effective asset management system. Fund, plan, coordinate, execute and deliver quality projects on time and on budget. Continually improve the quality of our services and enhance the value of RTA to the community. Safety: The safety of our passengers, our employees and the general public is always our top priority. Ethics and Integrity: We are dedicated to the highest ethical standards, including uncompromising honesty and integrity in our daily activities. Service Excellence: We will provide safe, clean, reliable, on-time, courteous service that our customers and the community will view as outstanding. Fiscal Responsibility: We are committed to manage every taxpayer and customer-generated dollar as if it were coming from our own pocket. Teamwork: We believe in teamwork and will foster a spirit of cooperative effort within RTA and with our partners. Responsibility and Accountability: Every individual is accountable. Meeting our individual responsibilities will ensure that collectively, RTA is a high-performing organization. We will meet all regulations and commitments and continually strive to improve. Respect: We will treat all members of the RTA family, our customers and the general public with dignity and respect. Vital Few Objectives (VFOs) are an integral part of the Strategic Plan of the Greater Cleveland Regional Transit Authority (RTA). VFOs are the driving force behind the performance of every RTA employee. In 2014, RTA staff and focus groups worked to determine strengths, weaknesses, opportunities and threats (SWOT). Then, they addressed the question – "What are the primary objectives (or Vital Few Objectives) that we really need to focus on in the next 18 months?" After much discussion, nine objectives were selected. The next 18-month process started in April 2016, with a new Strategic Planning Process. At that time, the next set of VFOs was be established, as RTA continues to move forward. VFO: Increase service usage and grow passenger satisfaction. Assigned to: Stephen Bitto, Executive Director of Marketing & Communications. RTA's 2010-2020 Capital Plan is an update of the agency's 2004 Long Range Plan titled Transit 2025. This Capital Plan gives RTA a clear path to the future, and will ultimately help make RTA the transportation mode of choice for Greater Cleveland. This is the time to "Re: imagine" the RTA. "Re:" — In English, this abbreviation is short for "regarding" and draws special attention to a particular subject matter. RTA’s 2010-2020 Strategic Plan is "regarding" many different topics important to the citizens of Cuyahoga County — and beyond. The plan is a guide for RTA — to refocus, restructure, renovate, reallocate and reenergize in difficult economic times. This summary of the overall plan provides a snapshot of RTA’s strategy to redefine its path in our region. This plan is about the opportunities that lie ahead in safe, reliable and revolutionized modes of transportation. RTA WILL BE THE PREFERRED MODE OF TRANPORTATION IN THE CLEVELAND AREA. RTA aims to be the first choice for regional transportation and a one-stop source for integrated transportation information in the region through changes in decisions regarding transportation priorities, land use and development location. RTA will continue to put customer needs first. RTA’s motto is "Quality Service: Every Customer, Every Day." RTA has put this motto into practice with success, and this success culminated in RTA being named APTA’s Best Large Transit System of the Year in 2007. RTA will focus on ensuring access to employment and educational opportunities for regional residents. RTA’s most important role in the community is to provide transportation services that maximize residents’ access to employment and educational opportunities throughout the region. RTA’s capital investment and service allocation decisions will be made in light of the need to promote employment and workforce development in Northeastern Ohio. RTA will provide services cost effectively. RTA’s services are funded by a combination of local sales tax revenues, passenger fares, state and Federal grants. Taxpayers have a right to expect that RTA’s service be provided in a cost-effective way. State and Federal funding levels have steadily fallen and have become more restrictive, while local sales tax revenues rise and fall with changing economic conditions. RTA will seek to provide appropriate levels and types of services for various markets within its service area, while continuing to seek cost savings as well as additional funding at the state and Federal levels, and grants from non-traditional sources to support services and capital improvements. RTA will support regional approaches to transportation and land use planning that reinforce investment in existing employment and population centers, infrastructure and services. Downtown Cleveland, the Euclid Corridor and University Circle are the primary employment, medical and entertainment centers of our county and our region. Maintaining and renewing these and other existing residential and employment nodes are vital to the economic and environmental health of our entire region, particularly for Cleveland’s neighborhoods and inner suburbs. RTA will improve services to suburban employment centers. RTA must take steps to connect workers to jobs in the many large and growing suburban employment areas of the region through the usage of innovative technologies, service options and funding mechanisms to provide alternatives or supplements to its fixed route transit network. RTA will provide special transportation service support to those who need it most. RTA’s bus, rail and paratransit network is the primary form of transportation for thousands of the Cleveland area’s most vulnerable citizens – lower income people, people with disabilities, students and youth, and older people. RTA will honor its commitment to providing high quality transit services to provide mobility and dignity to all the citizens of its service area. RTA will provide services at a sustainable level given its financial resources. RTA’s services are funded by a combination of local sales tax revenues, passenger fares, state and federal grants, along with other sources. State and federal funding levels have steadily fallen and have become more restrictive, while local sales tax revenues rise and fall with changing economic conditions. RTA will seek to provide appropriate levels and types of services for various markets within its service area, while continuing to seek additional funding at the state and Federal levels, and grants from non-traditional sources to support services and capital improvements. RTA will increase its contribution to sustaining our natural environment. Public transit is an inherently environmentally-friendly activity because of its ability to move people more efficiently, and with far less environmental impact, than the private automobile. Transit reduces America’s dependence on foreign oil, providing mobility in the face of unpredictable fuel prices, and reduces emissions. RTA is committed to the principles of environmental sustainability and has made sustainability an organizational goal. RTA has many opportunities to grow and thrive as a transit agency, but also faces many constraints that could limit development. In many cases, there are specific constraints that mirror the opportunities, like two sides of a coin. RTA and the Cleveland region face some formidable challenges over the next ten years, but both have reason to be cautiously optimistic going forward. Opportunities and constraints are considered in two areas: market and resources. Market opportunities and constraints are those imposed upon the agency by the area and people we serve. Resource opportunities and constraints deal directly with funding and RTA operations and infrastructure. Tthe aging and dispersion of regional population. A lack of significant congestion in Northeast Ohio — which are symptoms of both a low-growth local economy and a highly decentralized distribution of jobs — as compared to other, similar regions of the country. RTA’s resource challenges are well known and shared by many other transit agencies around the country. The lack of financial resources has reduced the ability for RTA to provide new or expanded services to meet changing needs. RTA has prioritized the maintenance of a state of good repair of existing transit facilities. In the face of many negatives, there are several opportunities for RTA. New development in downtown Cleveland, including the development of the Medical Mart and Convention Center, and the new Casino, will change transit needs in downtown Cleveland, including needs on evenings and weekends. However, the greater opportunities are in the change in attitudes towards the environment and the role of transit in sustainability. Transit is a key component of a sustainable transportation network and a modern, sustainable lifestyle. Whether for financial reasons associated with continually rising fuel costs, or personal conviction based on environmental principles, there is a new market of transit rider. RTA must work to capture these riders, many young professionals, and retain them as regular, life-long transit users. Transit is a key element of the vibrant urban lifestyle that young professionals crave. Cities that are attracting young, creative professionals, like Boston, Chicago, Portland, Seattle, San Francisco and Austin, all have high-quality and expanding transit systems. Other opportunities include working within the existing network to strengthen our services and reaching out to adjoining counties to provide better connectivity beyond the Cuyahoga County borders. For additional resources, persistent lobbying is required for federal, state, and local funding. RTA successfully worked with the Northeast Ohio Regional Coordinating Agency (NOACA) to use unallocated Congestion Management and Air Quality (CMAQ) funding for operational support for the HealthLine and trolleys. Opportunities with partners like NOACA must be explored and enhanced. RTA will continue to pursue all available competitive grant funding opportunities, including those not directly from the Federal Transit Administration. RTA has received industry-wide praise for TransitStat, a data-driven performance management system. TransitStat has successfully identified operational inefficiencies through analysis of key factors in operations and maintenance, and made needed improvements. RTA also recently completed a comprehensive energy audit which identified areas for reduction in costs. 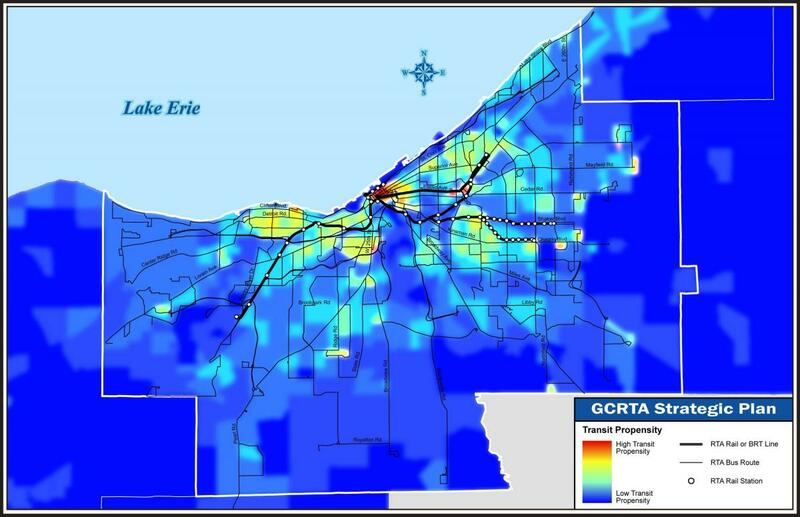 There are areas in the RTA service network that demonstrate high opportunity to grow transit market share. A transit propensity map was developed to show the areas with the highest potential for transit ridership. The analysis combined residential and employment density with demographics. Figure A shows the results of the analysis, which demonstrates the highest propensity in the urban core with pockets of opportunity in the outer suburbs. Conversely, the outer suburbs display a density and transit propensity that is difficult to serve with fixed route transit services. As jobs move away from Cuyahoga County’s core, so do people. RTA needs to streamline its services to ensure transportation still meets existing needs in the core, especially in the growth areas served by the HealthLine, and positioning itself to increase its market share of travelers to the downtown and Euclid Corridor core, while serving new riders in suburban neighborhoods in and out of the county. During difficult times in Cleveland when industry and people were drifting away from the city’s core, RTA strove to best serve its customers by expanding routes and offering more services to more people. Unfortunately, even these new growth areas are now less populated and auto-oriented, making them more difficult to efficiently serve with public transit. RTA must change to meet changing needs. The problem RTA faces in these uncertain times, however, is not knowing the future demand for its services, or the level of funding it will have to provide those services. Should the future demand for services be higher, and the funding be available to provide additional service, RTA must expand service, replacing reduced levels of service on existing routes and filling in its network. Should demand or future funding levels be lower, RTA must continue to retrench its services and focus on maintaining its state of good repair, while continuing to provide basic transit services to meet the needs of area residents. Looking towards the future, RTA will make financial decisions based on maximum benefit to our customers. This means restructuring our network with a focus on concentrated populations and encouraging their development. It also means finding alternative ways to serve outlying areas of the county with lower populations. To change, RTA must reevaluate all routes and services. These are not easy financial decisions to address, but they are vital. Even with the recent financial struggles, RTA has worked diligently to maintain a base transit network for Cuyahoga County. As RTA evaluates where service needs to be augmented to complete its network, and to better connect residents to jobs with the service restructuring, the Park-N-Ride and Transit Center network need to be continually evaluated. The completion of the Park-N-Ride system has been a component of RTA’s plan for many years. As RTA shifts its priorities to a maintaining a state-of-good repair, only those areas that demonstrate the greatest need for these facilities will be considered. Existing facilities shall be reviewed for parking and amenity additions. As shown in Figure B, RTA recommends dividing its service area into core and flexible zones. The core service area will be comprised of the City of Cleveland and inner higher ridership suburbs with larger populations. The peripheral areas of the county will make up the flexible service area. Core Area: Provide fast and frequent service along recommended priority transit corridors (Figure C). Stations, bus stops and transit facilities will gradually be improved along these corridors. There are many existing riders in this area, along with need, due to larger employers and residents. 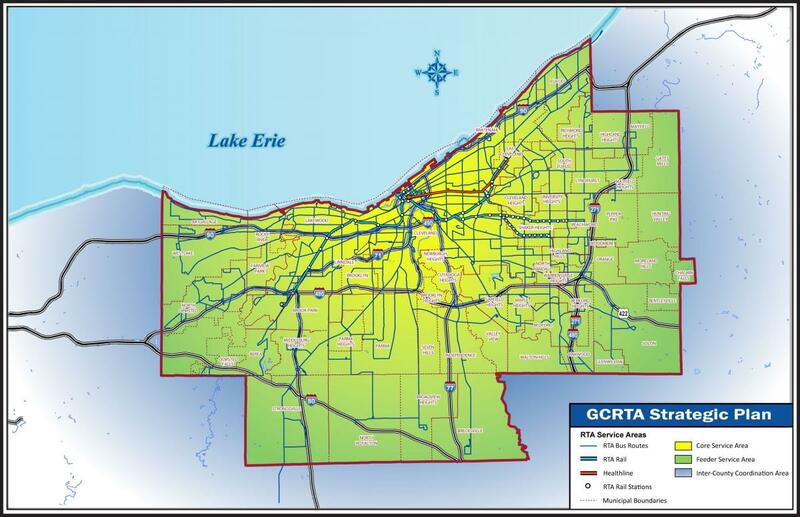 Flexible Service Area: With fewer people, but remaining need, RTA will provide these areas with a combination of fixed routes for network connectivity augmented by Park-N-Ride Express and paratransit service for the disabled. RTA shall work with local employers and others to assist in funding and operate non-base service options, such as shuttles or van pools. Developing these Priority Transit Corridors along RTA’s most popular routes within the core service areas will increase the mobility of existing riders, while offering more amenities and improve the quality of service. This will require close collaboration with multiple municipalities. In addition to the existing rail and HealthLine services, RTA could potentially provide high-quality service and improved transit accommodations along nine additional corridors shown in Figure C below based on funding availability and coordination with local communities. The corridors and their improvements would be completed in collaboration with the individual cities where the corridors are located. This coordination will demonstrate to the community that these corridors are areas where RTA is committed to providing high-quality transit service and ideally, new development. The revitalization of these areas is an important part of building a more sustainable, transit-oriented future for the region. Maintaining and continuously improving the current bus and train networks remains critical for RTA. All improvements must complement any new service decisions, to encourage and support growth in Cuyahoga County. RTA strives to encourage economic growth in core communities by maintaining and improving its infrastructure and renewing development along its path. Over the years, RTA has developed and maintained an impressive and efficient rail and bus system. As a result of Cleveland’s current economic reality, it is critical for RTA to reevaluate the infrastructure required to sustain the existing transit system – a system that includes 85 bridges and culverts, one tunnel, four bus maintenance facilities, one rail maintenance facility, seven transit centers (including the recently opened Stephanie Tubbs Jones Transit Center), twelve Park-N-Ride Lots and 23 rapid transit station facilities. The rail system includes 37 two-way miles of track and 52 stations, while the 7.1 mile HealthLine includes 4.5 miles of two-way bus lanes, and 59 stations. Projected ahead, RTA has nearly $100 million in unfunded state of good repair projects in our five year capital improvement plan (CIP). RTA is not alone. The Federal Transit Association estimates that the transit industry needs $78 billion to achieve a state of good repair. State-of-good repair will remain a key item on the Federal agenda for transit agencies. Future analysis and new development of RTA’s restructuring will guide the agency’s actions related to its current system and facilities. RTA will continue to aggressively work towards state of good repair while balancing any needs for capacity enhancement or new facilities in an ever-changing regional environment. While the fare paid by transit users pays a portion of the cost of transit, the majority of the cost of RTA’s public transit service is provided by county sales tax revenues. The balance of the funding is from state and federal funding. Like the rest of the region, RTA has struggled with declining revenues and must continue to investigate and pursue alternative, reliable and adequate funding sources. Deciding the best way to invest in capital resources to receive the best return on the dollar for customers is vital. RTA must aggressively pursue new funding sources and investments to sustain its financial future. With fewer riders and decreasing State of Ohio and sales tax revenues, RTA’s funding is down substantially. Now is the time for effective and broad-based collectives to be formed, lobbying for additional federal, state and local funds, along with working together with local communities and major employers to share in the cost of transportation. RTA continues to search for transit funding. Even as the leading transit agency in the State of Ohio, minimal funds come from the state. Due to increased efforts, politicians and citizens seem to better understand RTA’s revenue issues, while recognizing the benefit RTA provides to the community. RTA will also continue to aggressively pursue discretionary grant funding opportunities for capital and service improvements. Our past performance with successfully obtaining and executing competitive grant funding indicates the agency is strongly positioned for future opportunities. RTA has increased fares on its system repeatedly in recent years, ensuring that transit users share with other taxpayers the burden of providing the transit service that they use. As a result, RTA’s fares are now among the highest in the country. While it is important that transit users pay their fair share of the cost of providing high quality transit service, it is important that high fares do not discourage transit use. This could increase auto use and the pollution and traffic problems this causes, and place an undue burden on new workers and other lower-income people who depend on transit service. RTA’s goal is to maintain the current fare structure while finding alternative funding to maintain its operations. The time for change is now. The NE Ohio region was especially hard hit by the recession, and County government is in evolution. As we all look towards a revitalization from population loss and dispersion, RTA has a key role to play. Transit must take a step forward from reacting to redeveloping the new NE Ohio. 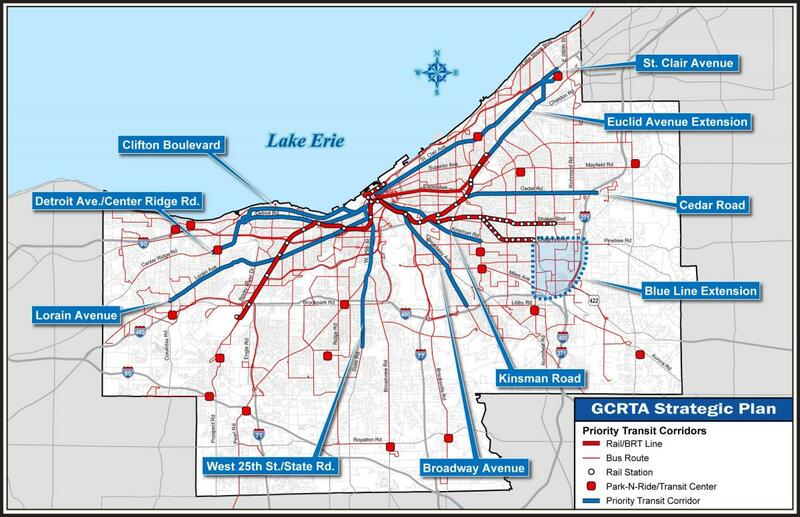 For many years, RTA has been brainstorming with other regional transportation agencies about the development of a multi-county regional transit system to better connect all of Northeast Ohio. There are a large number of commuters that traverse county lines for work each day and significant barriers exist for transit riders traveling between counties. RTA forming a team with the NOACA Transit Council benefits the entire northeast Ohio region. RTA and the other transit agencies need to work together with NOACA, the cities, counties, developers and various planning organizations throughout Northeast Ohio to make transportation and land use decisions. With coordination and cooperation among all these groups, urban sprawl — which has traditionally had a negative impact on transit service – can be leveraged. RTA can educate the public about how even small changes to development plans can make better transit environments. This, in turn, generates higher transit ridership, more attractive development and a higher quality of life for those who live, work and shop in these areas. Costs for transit are rising; that includes wages, benefits, fuel, oil and tires, just to name a few. Resource coordination and outsourcing are two options to fight high costs and make public transportation easier for customers to use throughout the region. Items for consideration range from vehicle, fuel, and parts purchasing to fleet maintenance, human resources, and payroll functions. Universities within Ohio are finding synergy and cost savings through a similar concept of shared state contracts. Providing contracted transportation services to other counties in the region would be beneficial for both RTA and the outer counties. Inter-county service would improve options for riders with no service or limited routes. There are many examples across the nation, such as Denver RTD, that combine privatized transportation services with union labor forces to provide a blend of operating strategies. Each day, tens of thousands of Cleveland area residents (many of whom would otherwise drive) choose to use RTA for their transportation needs. Using RTA reduces the need for new highway infrastructure, the use of fossil fuels and the production of pollutants and greenhouse gases, helping the Cleveland area to meet its environmental goals. RTA has made sustainability an organizational goal with its sustainability policy. RTA can and will improve its environmental performance by considering use of vehicles and equipment that increase efficiency and reduce pollution, through LEED® certification of its facilities and accreditation of appropriate members of its staff. Coordinate NOACA regional travel forecasting models with adjacent regional forecasting models.